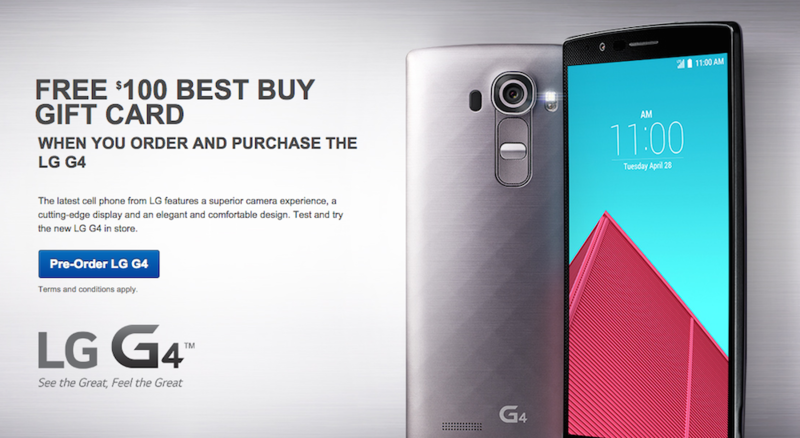 Posted up on Best Buy’s website, when you pre-order the upcoming LG G4, you shall receive a $100 gift card to spend on whatever you would like. In order to be eligible, it appears you need to sign up on a new two-year agreement for the device, or be eligible for an upgrade, but as of right now, there are no carrier restrictions. You can pre-order on Verizon, Sprint, or AT&T and still receive the gift card. For those who were intending to purchase the device outright, we can’t yet confirm if you will receive the gift card. Note: It appears Best Buy is in the midst of removing the product listings, as they show the release date for each carrier variant. These dates may or may not be accurate, but we at least know for sure that the device launches June 5 on Sprint.